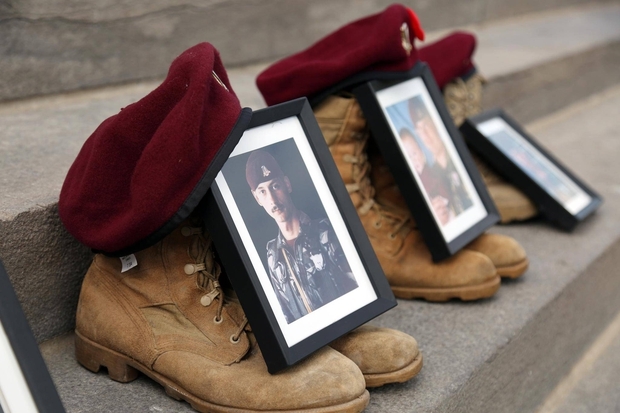 A photo and boots of Master Corporal Clayton Matchee and others are placed on the front steps of Parliament during an anti-malarial drug mefloquine rally on Sept. 19, 2017. Justice Department lawyer Elizabeth Richards told the Ontario Superior Court on Friday that the lawyers for Ronald Smith, a former member of the now-disbanded Airborne Regiment who is the lead plaintiff in the case, have provided no reasonable explanation for the amount of time it has taken to move the case forward. It would be impossible at this point, Ms. Richards told Justice Robbie Gordon, for the government to call witnesses who could provide accurate testimony around the way mefloquine was dispensed to the troops who took part in the Somalia mission of the early 1990s. That means, she said, there cannot be a fair trial. Justice Gordon is being asked to decide whether the case can be certified as a class action so many years after the first documents were filed in the court. Ms. Richards said the judge must balance the potential unfairness of the delay, which both she and Wayne Stickland, the lawyer for Mr. Smith, agree has been inordinate, and the right of Mr. Smith and the other veterans to obtain justice for the harms they say they have suffered. Mr. Stickland told the court that his office has been contacted by hundreds of Somalia veterans who say mefloquine left them with long-term mental problems. If this case is thrown out, he said, another plaintiff will quickly step forward to launch an identical suit. That appeared to concern Justice Gordon, who asked both sides to return after Christmas to present their arguments about whether this class action is the end of the line for Somalia veterans who want to sue for the damages that they blame on mefloquine. According to Mr. Smith’s statement of claim, the drug he was required to take in Somalia as part of a poorly executed clinical trial left him with a host of residual mental-health issues, including depression, aggressive behaviour, poor concentration, social isolation and suicidal thoughts. He says his Charter rights were breached and is alleging battery and negligence. His suit, which was launched in 2000, sat nearly dormant before being taken over and restarted last year by Mr. Stickland. In explaining the delay to Justice Gordon, Mr. Stickland said there had been a long debate between lawyers about who was best positioned to represent Mr. Smith in court. In addition, he said, the case was hampered by Mr. Smith’s own mental state, a lack of scientific evidence in the early years to link mefloquine to the types of symptoms suffered by the veterans, and a lack of expert witnesses. That evidence has now become more solid and he has secured an expert witness, Mr. Stickland said. And even when Mr. Smith’s mental state improved in 2010, the previous lawyers for Mr. Smith did nothing to move the case forward, she said. Despite the number of vets who say mefloquine caused severe problems, Ms. Richards said, “the conclusion to date is that there is no conclusive scientific evidence” to link mefloquine to the permanent psychiatric disorders they have described. Two of the soldiers on the Somalia mission were charged in the beating death of a Somali teen, and many others complained of alarming dreams, hallucinations and depression.